Review Posted March 14, 2010. Houghton Mifflin Books for Children, 2009. 32 pages. I'm a huge fan of Steve Jenkins' art work. He uses cut paper, and is able to make animals that to me look completely realistic. His textures mimic fur or scales or feathers so thoroughly you want to touch the soft-looking ones. But you probably shouldn't touch any of the animals in this book. 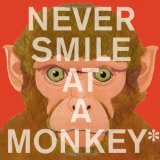 Never Smile at a Monkey is essentially a list of 18 ways certain animals can kill you or severely hurt you. For example, the author advises you never to harrass a hippo, jostle a jellyfish, or step on a stingray. All of those creatures are capable of killing human beings. Some of the animals in this book are dangerous in surprising ways. This is definitely not a book for very young children who might be frightened. But certain school-age children will find these facts gruesomely interesting. And, as I said, the pictures are amazing. And, by the way, why shouldn't you smile at a monkey? If you smile at a rhesus monkey, it may interpret your show of teeth as an aggressive gesture and respond violently. Even a small monkey can give you a serious bite with its long, sharp fangs.